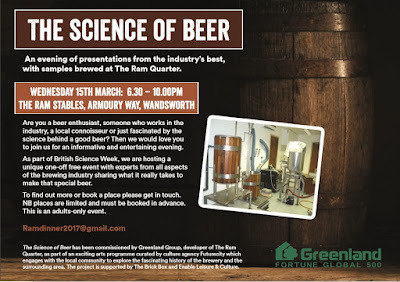 Last month I did my bit for British Science Week by giving a talk on malting at the Youngs brewery in London. Well, sort of the Youngs brewery as it must be ten years since it closed, but it was on that site and there was beer from the Ram brewery there. I was particularly pleased about that last point, as though I did visit the Ram brewery once for a SIBA event I didn't manage to get any of the beer. It was good stuff too, with that nice tongue coating bitterness. 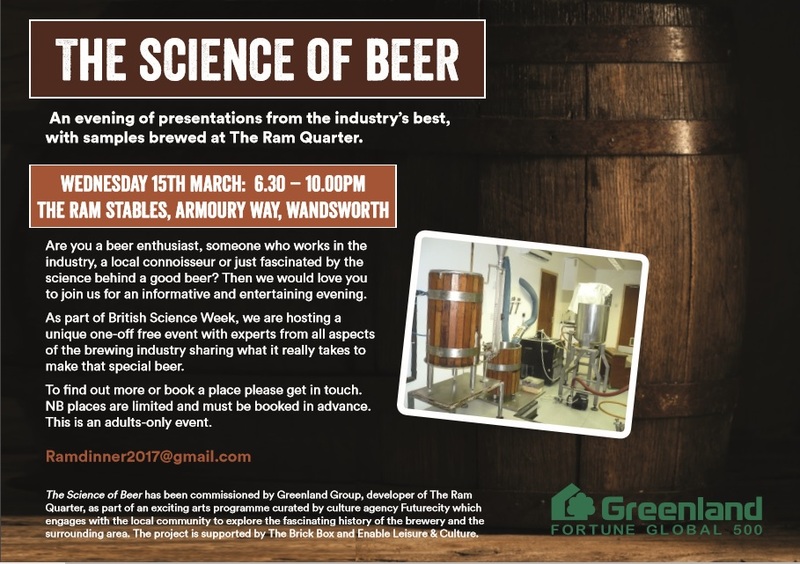 A series of speakers was lined up, which started with Steve Livens, who at one point was a microbiologist at Youngs, though he's now at the BBPA where he spends his time trying to destroy craft beer at the behest of his evil multinational overlords, amongst other things. His talk stated by going back 10,000 years to the earliest history of beer, and took us up to the present day and the nutritional benefits of beer. Next was Charlie the head brewer at Wimbledon brewery, who took us through the brewing process and the materials involved. Sadly two of these hop farms have gone, but the Hampton Estate is not only still growing hops, it has recently expanded production. Intriguingly though it now only uses one bell on its hop pockets. I was on after an interval, which was perhaps for the best as it gave more people more time to pour beer down their throats before my scientific onslaught. As I'd been asked to talk at a science event I'd been pretty merciless in cramming the detail in to my talk. Steeping, kilning, germination, Maillard reactions, that sort of thing. I don't know if it's quite what the audience were after, but I felt I'd done my bit for science. I was followed by Craig who took us through his experiences of home brewing, and the difficulties in getting it right. He's now adopted a feedback system based on his experiences as a computer programmer, which didn't sound a million miles from the Deming cycle. Lastly we had a poet, who moved things back to history and his plan to recreate a Youngs brewery dinner based on an old photograph of a staff event. Then it was time for a quick pint or two of networking before heading home.